It’s been a fun few months, to say the least! 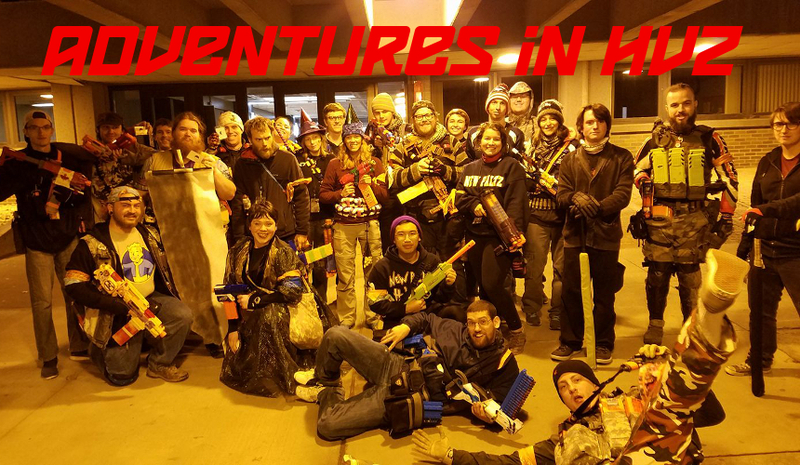 In between work schedules, appointments, and life in general, I found time to make it to a few HvZ games. Less than I’d like (I missed both the BGSU and Ohio University Invitationals), but enough to keep me on my toes! This was a long trip from Ohio, taking up virtually an entire day in either direction. Granted, I made more than a few stops at thrift stores, Walmarts, and regional stores that aren’t in Ohio. Still, it’s the farthest I’ve personally driven for any type of Nerf War or HvZ event, my Canada trips included. I made this trip mainly to meet many fellow players I’ve talked to online. Personal connections and all that. Big thanks to Dennis, one of the New Paltz crew, for letting me crash at his place for two nights. This was a great one. 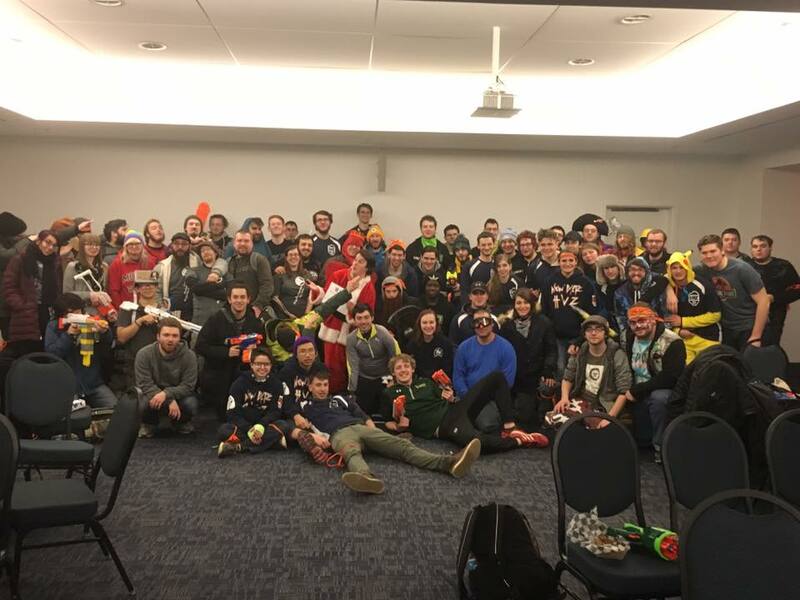 YSU held a Game of Thrones “Survivational” where we split up into three factions (Stark, Targaryen, and Lannister) and fought to dominate areas of central campus at different points of the day. We earned gold for all the areas we held, to be spent on human goodies and such. Partway through the day, after a “disastrous” wedding which spawned zombies, the factions had to fight both each other and the zombies. So the day ended up being part Nerf War/King of the Hill, part HvZ, and it worked quite well. The night missions before the main event (which were mainly for fun, aside from the BFG), I ran around with a Buzz Bee Boss and a bunch of twelve dart mega clips. Most of the day, until it stopped working, I ran my Captain America Fraudulus. When that happened (an easy to fix issue, at least), I had to run as a sock ninja to help defeat one boss zombie. For the finale, I opted to run my Flipbow for the accuracy and the ammo density. It ended up being a wise choice, and I shot over 250 Boomco darts during that time. Almost the last human, but I paused in one place for two seconds too long. It was a blast, especially since part of the New Paltz crew made the drive to Ohio! I don’t have any good pictures or footage, sadly, but it was a great time. The theme was saving rock and roll, as Adam Levine was going through time and trying to destroy good music. So we had missions to reunite the Beatles (and avoid a boss Yoko Ono), get Elvis to a performance (we failed miserably), and do various minigames against the zombies (TANK BOP-IT!). Partway through, I earned the Vanguard ability. Essentially, I had a short foam noodle sword for tagging zombies. In addition, I could snap a glowstick and be invulnerable for thirty seconds each mission. This was best used in the finale, when there were only a couple humans left. Half a second before I was caught, I snapped the glowstick, started counting out loud to thirty, and began tagging almost the entire horde. Then I died shortly after. But it was at least a valiant death. I used my Flipbow the entire day; I’ve gotten very used to using it. It was crazy how many zombie I made good shots on right as they were respawning. Many headshots were had. If anything, I at least got the award for best human! 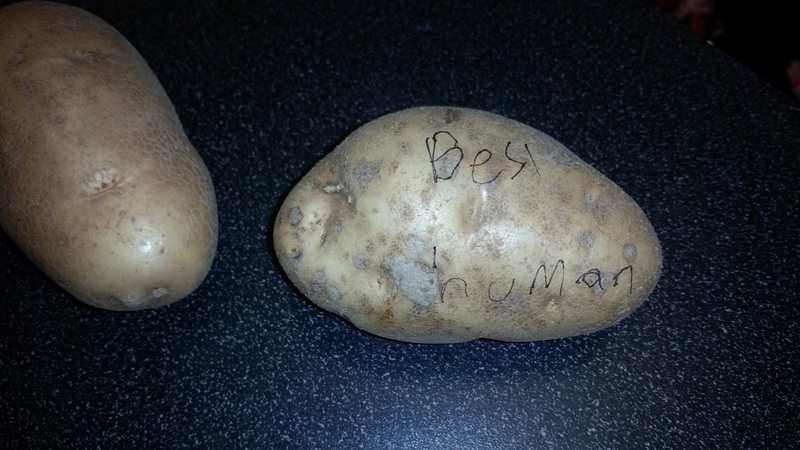 It was a potato. This entry was posted in Game Reports, Just For Fun on April 11, 2017 by BuffdaddyNerf.